If there’s anything you can say about Q Games’ PixelJunk series of games, it’s that they exemplify gameplay mechanics in their purest form. 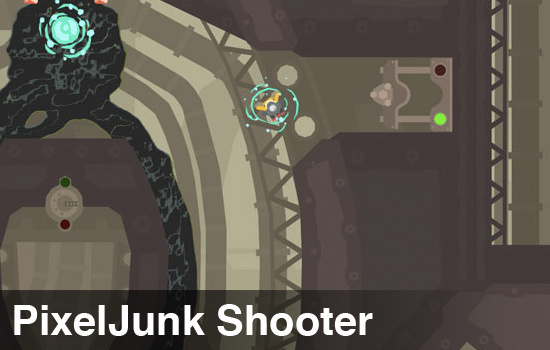 The latest entry, PixelJunk Shooter is no exception. It also happens to be a great example of how to introduce new mechanics to the player organically, teaching by doing, rather than stringing the player along with a tutorial. Though your abilities always remain the same (shooting and picking up objects/survivors), the type of objects begin to vary and you’ll learn different ways to use the elements in tandem and carve your way through the cavernous levels. The premise is simple: you need to rescue survivors of a research colony stranded in the subterranean caverns of the planet your ship is orbiting. It’s sort of a laid-back twin stick shooter mashed up with the NES game Solar Jetman and Choplifter. Your gun and your grappling hook are your primary methods of interacting with the world, the former for shooting away breakable materials and the latter for picking up treasures, survivors or several special items littered throughout the levels. Physics and the interaction between hot and cold elements in each level play an integral part in the game. When magma touches water, it cools to a solid, breakable rock. The levels are often laid out in a manner where you will have to mix the various fluids to form safe passageways that will keep the magma from immolating your poor survivors. Later on, you’ll come across ice and gas, both of which act as you would expect them to. Magma and water “suits” for your ship allow you to take the elements into your own hands, should the resources in a level prove to be insufficient. Exposure to heat eventually wears through your ship’s hull and will send you to a fiery death, so managing how much heat you take in is important. You can either stay away from the hot stuff, or dunk your ship in a nearby lake to cool off. The choice is yours! Overheating causes you to lose control of your ship, and as soon as you collide with something solid you will explode. With some luck, you might fall into a water source and escape, but this is not something to count on. A variety of enemies will also try their best to ruin their day, introducing both bullets and magma into the mix, so taking them out is probably a good idea. The shooting elements aren't usually too stressful, though at the end of each episode, you'll face a large boss that tests your skills in maneuverability and firepower. Arguably, the best part of any PixelJunk game is their unique use of music. Q Games collaborates with a different artist for each title, and this time they went with High Frequency Bandwidth, a British electronica outfit who provided a funky, almost trip-hop soundtrack infused with just the right amount of synthesizer noise and sci-fi samples. It perfectly evokes the mood the game tries to establish, and I would have to say it’s my favorite bit of game music of the year.